ADAIR - DeLACEY - On the 9th inst., by the Rev. George Brown, at the residence of the bride’s father, Mr. Wesley Adair, to Martha, youngest daughter of Mr. Stephen DeLacey, all of Fingal, Ont. ADAM - ELLIOTT - On the 16th ult., by the Rev. I. Tovell, Peterboro’, assisted by the Rev. J. McFarlane, Lakefield, at the residence of the bride’s father, “Hillside”, Peterboro’, Rev. A. L. Adam, Hall’s Bridge, to Bella, youngest daughter of Geo. A. Elliott, Esq. At Richmond, on Wednesday, Sept. 25th 1878, by Rev. A.B. Chambers, Mr. Jacob Alcombrack, of Hamburg, North Fredericksburgh to 'Rilla' A. Allison of Richmond. ALKENBRACK-SILLS - On Wednesday, January 6th, 1909, at Bay Parsonage, South Napanee, by Rev. C.W. Demille, Emma Gertrude Sills, eldest daughter of Albert and Mrs. Sills, Gretna, to Elmer Stanley Alkenbrack, Gretna. MARRIED - On the 2nd January, at the residence of the bride's father, by the Rev. R. Harding, Mr. Joseph Allen, to Miss Susan Gibbs, second daughter of T.F. Gibbs, a Prov. Land Surveyor, all of Adolphustown. No cards. MARRIED - On Monday the 6th April, at Fredericksburgh, by the Reverend R. MacDowall, Mr. Elijah Allen to Miss Ruth Harlow, both of that place. On Jan. 25th, J. Alexander Allen, Ph.C., of Toronto, son of Parker Allen of Adolphustown to Alice Victoria, eldest daughter of Dr. S.L. Nash, Picton. TOWNS - ALLEN - A pretty but quiet wedding took place at the home of Mr. Geo. Towns, Ninga Man., on Wednesday afternoon, January 8th, when his daughter, Minnie, was married to Mr. Harry Allen of Thornhill. The Rev. C. Teeter performed the ceremony. The bride was charmingly gowned in grey English broadcloth, made in jumper style, trimmed with white silk overlace and applique. She was attended by her sister, Miss Jessie Towns, who wore a beautiful jumper suit of many blue. The groom was attended by his brother George Allen of Winnipeg. After the service a reception was held, at which about forty guests were present. Mr. and Mrs. Allen left on Thursday morning’s train for Winnipeg and on their return will reside in Thornhill. The bride was the recipient of many beautiful and costly presents, which testified to the high esteem in which she was held by her many friends. BALFOUR - ALLISON - “Hickory Grove”, the home of Mrs. Thos. Balfour, Bath, was the scene of a pretty wedding on Wednesday, Dec. 7th, when her daughter, Myrtle Helena, was married to Mr. Arthur Wright Allison, of Adolphustown. The ceremony was conducted by Rev. H. S. Spence, B. A. , Bath, in the presence of about thirty guests. The bride wore a lovely gown of cream silkeoline over taffeta, with garniture an yoke of embroidery chiffon and sleeves to correspond. a long white tulle veil was worn with a small wreath of orange blossoms. A pretty pearl crescent brooch was worn, the gift of the groom, and a beautiful bouquet of cream roses, lilies of the valley and ferns. Miss Etta Gray, of Kingston, cousin of the bride, was bridesmaid, and wore a dress of cream India silk, accordeon pleating, with yoke and sleeves of embroidered chiffon, and carried a shower bouquet of pink roses and ferns. Mr. John Allison, Napanee, cousin of the groom, was best man. The house was beautifully decorated with palms and evergreens, and the bride and bridegroom received many congratulations. The tables were lovely with similax and carnations most artistically arranged. Mr. and Mrs. Allison left on the early morning train for the West. The bride’s travelling gown was dark blue cloth with toque to match. Some very pretty and valuable gifts were presented from many friends. Mr. and Mrs. Allison will reside in Adolphustown on their return from their wedding trip. ALLISON - BALFOUR - A very pleasant gathering of relatives and friends at the residence of Mrs. Thos. Balfour, Hickory Grove, near Bath, took place on the 7th inst., at 4:30 p.m., to witness the marriage of her daughter, Miss Myrtle Balfour to Mr. Arthur Wright Allison, of Adolphustown. Miss Grey of Kingston, supported the bride, and Mr. John Allison, Napanee, was the groom’s best man. The following persons were present, Mrs. Gabriel Balfour and Mr. Kennedy, music teacher, of Bath; John B. Allison, Collector of Customs, and Miss Cora Madden, Napanee; Mrs. Grey and daughter and Mrs. Bryden, of Kingston; Mr. Harry Phippen and cousin, Miss Phippen, of Conway; Miss Hurlburt, Cressy; Mr. P. Balfour, Chemical Manager of the Cement Works, Marlbank; Mr. Geo. Hawley, Mr. Hugh Box, Mr. Raymond Allison, Mr. Nelson Davis and wife, J. B. Allison and daughter Edna, Mr. and Mrs. W. D. Roblin and Mrs. W.N. Mallory, and Mr. Fred Membery, of Adolphustown. After the marriage ceremony, which was performed by Rev. H. S. Spense, of Bath, the guests sat down to a table laden with luxuries. After the sumptuous repast the music began, and the young and light hearted at once took the floor and went merrily round, and those that looked on were enjoyed and laughed with merry delight as though the years past and gone had returned again in a night. In the gay and amusing time, the hours soon fled and the happy couple were driven away by Mr. John Allison with a pair of fancy white horses to catch the midnight train at Napanee for Toronto and other western towns. Amid a shower of rice and best wishes the whole party dispersed. The presents were numerous and costly. A Pretty Wedding - One of the prettiest weddings of the season occurred at the residence of W.H. Cadman, Adolphustown, Wednesday, Sept. 4th, when his daughter Minnie was united in matrimony by Rev. R.M. Pope, assisted by Rev. Mr. Shorey, to C.F. Allison, Adolphustown. Miss Cora Murdoff, Belleville, cousin of the bride, and Mr. Allison, Port Perry, assisted the happy couple. After a sumptuous wedding breakfast, Mr. and Mrs. Allison followed by good wishes and showers of rice, left on the steamer Hero for an extensive trip in the eastern states. A pleasing feature of the ceremony was an aisle formed of white satin ribbons held by four young ladies, who undertook to keep a place clear for the bridal party. Mendelshon's wedding march was played by a well and favorably known Kingston young lady, cousin of the bride. The presents were both numerous and costly. Harry Allison, age 23, Res: South Fredericksburgh, b. Canada, Bachelor, Farmer, Methodist, son of Henry Allison & Martha Wright. Married at Adolphustown, December 19th, 1900 by Roger Allin. Witnesses: John B. Allison, So. Adolphustown & Alberta B. Roblin, Adolphustown. The marriage of Miss Frances Forester, third daughter of Mr. and Mrs. J. Forester, Bath, to Mr. Raymond Joseph Allison, son of the late D.W. and Mrs. Allison, Adolphustown, was solemnized in the Methodist Church at 4 o’clock on New Year’s Day by Rev. J. B. Everson. The bride, who was given away by her father, was gowned in cream duchess satin, with pearl trimming and carried white roses. Her tulle veil was draped in cap effect, caught up with orange blossoms. The bride was attended by her sister, Miss Margaret Forester, who wore yellow silk trimmed with plaited chiffon and sable fur, and carried cream roses and violets. The groom was supported by his brother J. B. Allison, Napanee. The ushers were: Mr. W. P. Detlor and Mr. R. Roblin. the wedding march was rendered by Mill M. T. Keller, Toronto. During the signing of the register, Mrs. (Prof.) Robertson, Toronto, sang “A Psalm of Love.” After a reception at the home of the bride’s parents, Mr. and Mrs. Allison left for Camden, New York, and other points. The bride travelled in a suit of brown Redford cord, with plush hat to match. On Wednesday, the 23rd of January, there was a gay and festive gathering at the residence of Mr. James L. Loyst, Hay Bay, South Fredericksburgh, to witness the nuptial ceremony between his oldest daughter Maggie, and Mr. Roderick Allison, only son of Cyrus. B. Allison J.P., reeve of South Fredericksburgh. The ceremony was celebrated by the Rev. J.C. Ash, assisted by the Rev. W. R. Young. The handsome couple, so well mated, received the heartiest congratulations of their numerous friends. They left Napanee by the evening express for a trip to Toronto and other points. west. David Wright Allison, Adolphustown, married Amelia Elizabeth Membery, August 22 1876. The spacious home of Mr. and Mrs. Leonard T. Parks on Hay Bay was the scene of a charming wedding on Saturday evening at eight o'clock, when their youngest daughter, Marjorie Leone, was united in marriage to Frederick Hugh Allison, son of Mr. and Mrs. Fred Allison, of Adolphustown. Rev. J.E. Beckel of the Bay Circuit officiated. The drawing-room was beautifully decorated with gladioli and asparagus fern, in colors of yellow and green. The bride who was given away in marriage by her father, looked lovely in a gown of maise georgette and carried a bouquet of pink roses tied with mauve. The wedding music was played by Miss Edith Allison. Following the ceremony a buffet lunch was served by a number of young friends of the bride. The dining-room was vey prettily decorated in the same yellow and green scheme. Later the happy couple left for a boat trip to Montreal Quebec and the Saguenay. On their return, they will reside in Adolphustown. A pretty wedding, which united two of the oldest United Empire Loyalist families of Eastern Ontario, took place on Saturday evening, October 22nd, at the home of Mr. and Mrs. Leonard T. Parks, Hay Bay, when their daughter Evelyn Mercedes, was united in marriage to Mr. Vernon Ross Allison, son of Mr. and Mrs. C. Fred Allison, of Adolphustown. The Reverend Harry Pawson, of Trinity Church, Napanee, conducted the ceremony. Yellow chrysanthemums and asparagus fern made pleasing decorations. The wedding music was played by Miss Edith Allison, of Ottawa, sister of the groom. The bride wore a becoming gown of Bermuda pink georgette, and carried a shower bouquet of ophelia roses and lily of the valley. Miss Marjorie Parks, sister of the bride, in orchid georgette was her only attendant. The groom was supported by his brother, Mr. Hugh Allison. The groom's gift to the bride was a beautiful white gold and diamond-set pin; to the bridesmaid and pianist, bar pins, and to the best man gold cuff links. A dainty lunch was served by the Misses Kathleen Roblin, Geneva Roblin, Marion Miller, Hazel McCabe, Jean Robertson and Helen Milling, personal friends of the bride. The happy couple left for an extended motor trip to Montreal and the Eastern States. ALLISON - ROBERTS - At Adolphustown, Ont., on July 27th, Florence Isabel, daughter of Rev. Canon Roberts, to Dr. D. M. Allison, Williamstown, N.Y.
On Saturday, October 11th, 1922, at Napanee, in S. Mary Magdalene church, by the Rev. J.H.H. Coleman, Elizabeth Andrews, daughter of Mr. and Mrs. H.B. Sherwood, of Napanee, to John B. Allison, son of Mrs. D.W. Allison and the late D.W. Allison, of Adolphustown. MARRIED - At Fredericksburg by the Rev Robert McDowall, Mr. Jeremiah Amey to Mrs. Magdalane Gunsoles eldest daughter of Mr. Joseph Gonsoles, of the same place. ANDERSON - HULETT - On Wednesday last, at the residence of Mr. J. S. Hullett. West street, his niece, Miss Dora Bell, was married to Mr. J. P. Anderson, youngest son of Mr. Luman Anderson, North Fredericksburgh. Rev. S. T. Bartlett performed the ceremony. Only the relatives and intimate friends were present. The bride was attired in a navy blue gown, with hat to match. Miss Lottie Allen was bridesmaid, and the groom’s brother, Mr. Frank Anderson, rendered all necessary assistance in his capacity as best man. The marriage took place in the drawing room, which had been very prettily decorated with vines and flowers. Mr. and Mrs. Anderson left on the 11:25 train for Almonte, where he has been for some time, and where he has worked up a good photographic business. The young couple are well known in our midst, and will be greatly missed by their large circle of acquaintances..
Anderson-Fretts - At Hawley, March 9th, Morley Anderson, Prince Edward county, to Birdie Luella, youngest daughter of W.R. Fretts. FRETTS - ANDERSON - A pretty wedding was solemnized at the residence of Mr. and Mrs. W. R. Fretts, at Hawley, on Wednesday, March 9th, 1898, when their youngest daughter, Miss Birdie Luella, was united in the bonds of matrimony to Mr. Morley Anderson, of Ameliasburgh, Prince Edward. The nuptial knot was tied by the Rev. E. S. Shorey, in the presence of about forty invited guests. The bride was handsomely attired, and was assisted by Miss Laura Hawley, of Napanee, while Mr. Ebby Fretts, brother of the bride, acted as best man. The ceremony took place at 10 a.m., after which all partook of a sumptuous wedding breakfast, which was enjoyed by all. Birdie was a general favorite and as such will be greatly missed both in the home and community at large. The beautiful and costly presents bore testimony to the general esteem in which the bride and groom are held. Mr. and Mrs. Anderson left by the noon train for a visit with friends in the East, and were escorted to the station by a number of their friends. The hearty bon voyage well expressed the universal good will as to the young couple's wedded life. Married - on the same day [Sunday the 19th], at Amherst Island, by the Rev. Robert McDowell, Mr. John Anderson of Fredericksburgh, to Miss Mary Ann Howard, daughter of Mr. John Howard of the former place. Married - At Picton, on the 15th October, in the Church of St. Mary Magdalene, by Rev. W. Macaulay, Mr. William Anderson, of Fredericksburgh to miss Thorp, of Picton. MARRIED - In this town on Wednefday evening laft by the Rev. G. O. Stuart, Mr. Henry H. Ansley to Mifs Elizabeth Dawson, both of Kingfton. ARMITAGE-URQUHART - At Napanee, on February 1st, William Armitage, Elva, Man., to Miss Alma Urquhart, North Fredericksburgh. On the 15th inst., Miss Victoria Membery, daughter of Fred Membery, was united in wedlock to George Armstrong, Brandon, Manitoba. The wedding was private. The bride was supported by her cousin, Miss Minnie Membery, Sackett's harbor, N.Y., and the groom by J.R. Allison, of South Fredericksburgh. Mr. Armstrong is the only son of the late Thomas Armstrong, Bath. George, on the settlement of the estate, started for Manitoba and purchased a large ranch near Brandon. The C.P.R. crossed the centre of his property, and for the last three years Mr. Armstrong has been raising from seven to nine thousand bushels wheat a year. He is clerk, collector and treasurer of the municipality of whitehead, receiving about the same salary as our county officers of Lennox and Addington. CADMAN - ASSELSTINE - A very pretty event transpired at the home of Mr. and Mrs. William Henry Cadman, Gosport; on Wednesday,, June 21st at high noon, when their youngest daughter, Agnes Dace, became the bride of Mr. Myro Tillison Asselstine, of Hawley. The ceremony took place in the drawing room, beneath a beautiful arch of evergreens and roses, with a back ground of palms and ferns, and was performed by the Rev. W. down, assisted by the bride’s cousin, Rev. R. M. Pope, Rednersville. Mendelssohn’s wedding march was beautifully tendered by Mrs. A. F. Miller, Wilton, throughout the ceremony, and while the bride was donning her travelling suit, Mr. Miller sang a beautiful solo. The bride, who was becomingly attired in white silk colienne with transparent yoke and mousseline-de-sole, wore the conventional tulle veil surmounted with white roses and carried a shower bouquet of white roses and maiden hair ferns; also wore a pearl locket, the gift of the groom. The bridesmaid, Miss Anna McCaughey, Deseronto, was prettily gowned in grey silk voile over old rose taffeta and carried pink carnations, also a pearl crescent, the groom’s gift. Miss Bessie Bloomfield, Kingston, niece of the bride, gowned in white organdy, made a dainty little flower girl, who from her basket scattered handsful of flowers in the bride’s pathway. Master Hugh Allison, nephew of the bride, manly performed the duties of ring bearer, who on a white satin cushion wreathed with roses, carried the precious wedding ring, and at the appointed time with outstretched arms, held his cushion for the groomsman, Mr. Albert Asselstine, to remove the ring. After the ceremony refreshments were served to about fifty guests. Toasts were proposed by Revds. Pope and Down, and seconded by Dr. Vrooman, to the health of the bride and groom, and the groom promptly and eloquently responded. Mr. and Mrs. Asselstine left immediately for Toronto and Niagara, carrying with them the best wishes of a host of friends. the presents were handsome and useful, testifying the esteem in which the couple were held. MARRIED - On Sunday evening last by the Rev. Robert McDowall, MR MICHAEL ASSELSTINE to Miss CATHARINE FRASER, daughter of ISAAC FRASER, Esq., M.P. of Ernest Town. 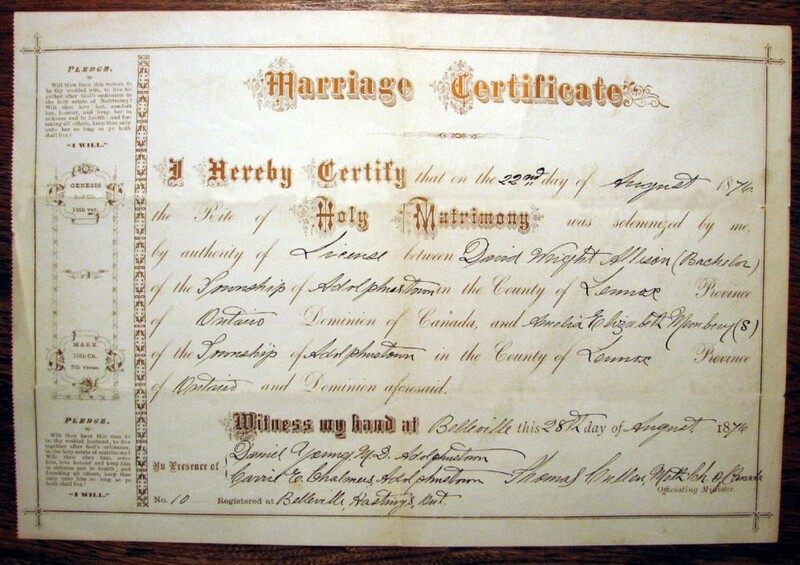 Married - On June 19th, at the residence of the bride's father, Samuel Nicholas, son of Nicholas Asselstine, of South Fredericksburgh, to Elmira C. daughter of Elias Huffman, of Camden. MARRIAGES – ASSELSTINE-HUDGINS – At the residence of the bride’s parents, on Wednesday, Feb. 22nd, by the Rev. J. E. Robeson, Mr. A. C. Asselstine, Minnesota, to Miss Clara Hudgins, of Selby. AUSTIN - GREEN - Carlten Street United Church was the scene of a pretty wedding on Saturday afternoon, when Mildred Green, daughter of the late Mr. and Mrs. George J. Green of New Ontario, was united in marriage to Murray P. Austin of Windsor, eldest son of Mr. and Mrs. Nelson Austin, Tilsonburg. Rev. J. J. Ferguson, pastor of the church, officiated. Mr. F. H. Puttenham played the wedding music, and Miss Gladys Young sang. The bride, who was given in marriage by her uncle, Mr. William Moyniham, wore a French gown of white crepe Romain heavily beaded. Her veil was of embroidered net, with coronet of orange blossoms, and she carried a shower bouquet of Ophelia roses and lilies of the valley. She was attended by Miss Lenore Austin of Tillsonburg, sister of the groom, gowned in honeydew georgette with picture hat to match. The groom, was supported by his brother, Mr. Hugh N. Austin of Toronto. Following the ceremony a reception was held at the home of Mr. and Mrs. William Moyniham, 135 Wright Avenue, for the immediate relatives. Mr. and Mrs. Austin left later on a wedding trip to Muskoka. The bride travelled in a smart navy ensemble suit with hat of rosewood and shoes to match. On their return they will reside in Windsor.